My Mother’s Wars is Lillian Faderman’s portrayal of her mother’s experience as a single woman struggling to survive in the New York garment industry as her Latvian family across the ocean struggles to survive growing anti-Semitism and the impending Holocaust. Dr. Lillian Faderman is a long time resident of Fresno. I recently had the honor of meeting and getting to know her. A retired professor of English at Fresno State, she was a trail blazer for women entering academia in the 1960s and 70s. She was a trail blazer in developing the fields of Women’s Studies and Gay Studies. I am told by my lesbian friends that her books on lesbian history are required reading for any woman in the process of coming out. This book is very different though. It is personal. Lillian tells, with “emotional truth” the story of her mother’s experience as a poor immigrant in New York City who not only struggles to survive on her own, but also struggles to save her family back in Latvia. As we approach Yom HaShoah, Holocaust Remembrance Day, My Mother’s Wars offers a perspective on the Holocaust that is timely and issues an ethical call for today. 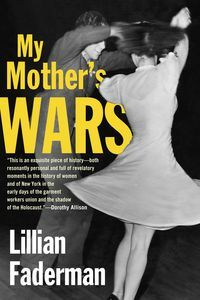 I am sure that Lillian did not intend for My Mother’s Wars to be a book primarily about the Holocaust. She wrote the book as a means of understanding her mother’s life and the choices that ultimately led her to become the strong, troubled, all-loving mother that she was. Yet, for those of us who can view Mary’s life from the outside, Lillian gives witness to the experience many of our families lived and endured. Watching and waiting, in pain and sorrow, feeling helpless as family members across the ocean fought a too-often loosing battle for survival. Through My Mother’s Wars we see the power of the media, film and print. We see the impact those media portrayals had on Americans’ understanding of the war and the Third Reich. Each chapter begins with “Time on the March”, excerpts from real-time newsreels and newspapers. As we read the transcripts of the newsreels Mary would have seen each time she went to the movies, we are transported to that time and place. We feel the increasing tension in Germany and Eastern Europe. We read of the United States’ reluctance to get involved. And from these emotionless news clips Lillian leads us into Mary’s own experience as she palpably feels the helplessness and impending doom to befall her family. For Mary, it sometimes took months to get news from her family. Footage shown in the movie houses was sometimes weeks old. But for us today, in the age of Twitter and live-streaming, we receive news as it is happening. One might rationalize that back in the 1930’s-40’s we didn’t really get the full story of what was happening. (Though I wouldn’t…) But today we do not have that excuse. We live with memory of the human rights failures of many countries, political and religious leaders, who stood idly by while Hitler and the Nazis devastated thousands of communities, murdering 6 million Jews and millions of Soviets, Poles, homosexuals, people with disabilities, Jehovah’s Witnesses and others. Today, when we say “never again”, we have no excuse to ignore human and civil rights violations happening in our world, in our back yards. Whether it is battles over civil rights here in the US, genocide in Sudan or Congo or crimes against gays and women in Uganda, the news is IRL, in real life and in real-time. This Yom HaShoah, I remember Lillian’s family and all those who were lost in the Holocaust. This Yom HaShoah, I hear the call to justice and action. To take a stand against the evil and hatred that still exists in the world. This Yom HaShoah, I pray that we can create a world in which all people can live in fullness of life, in safety, in love and in peace. Check out Jewish World Watch.